Modern container ships are made from welded steel plates and can have length of up to almost 400 m. They carry huge numbers of inter-modal containers (which can also be carried by truck or train). The first container ships were converted world war 2 T2 tankers typically 152.9 m in total length and 20.7 m in width (beam). The largest container vessel today is MSC Oscar, 395.4 m in length and 59 m wide and capable of carrying 19224 containers (TEU — twenty foot equivalent unit). As these ships travel the globe they are bashed by waves, in this video we can see the displacements this causes inside the vessel. Video shows the container ship MSC Busan in heavy seas. In the video at around 11 s a wave of height approx. 7-8 meters hits the vessel. The largest ship to date is was the Seawise Giant built by Sumitomo Heavy Industries at Oppama shipyard. A ship so big that it takes Top Gear presenter Jeremy Clarkson to describe it. Seawise Giant had several names since it’s building from 1974-1979 and it’s scrapping in 2009, including Knock Nevis. 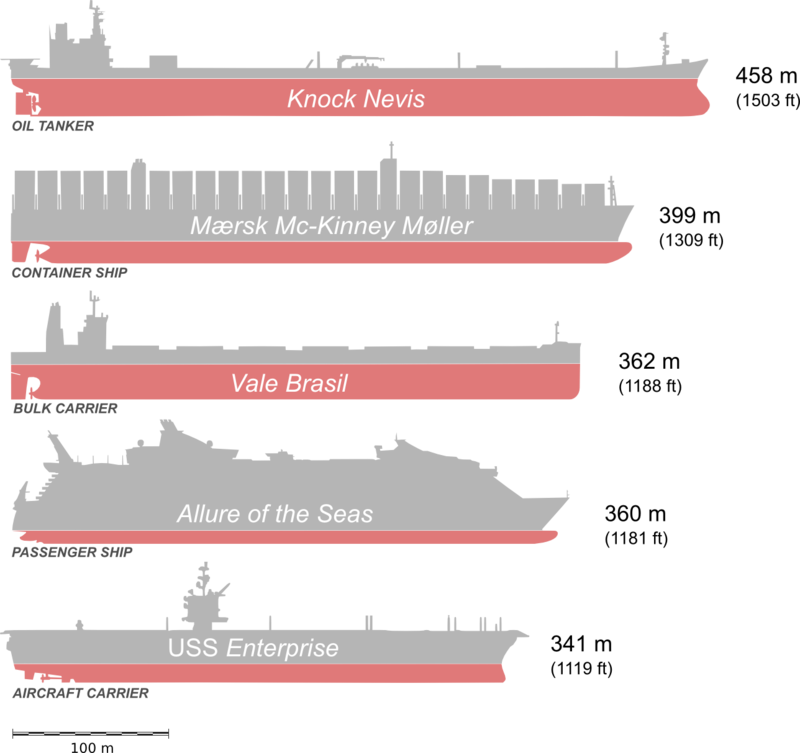 Here is a comparison between some of the other largest ships in the world. 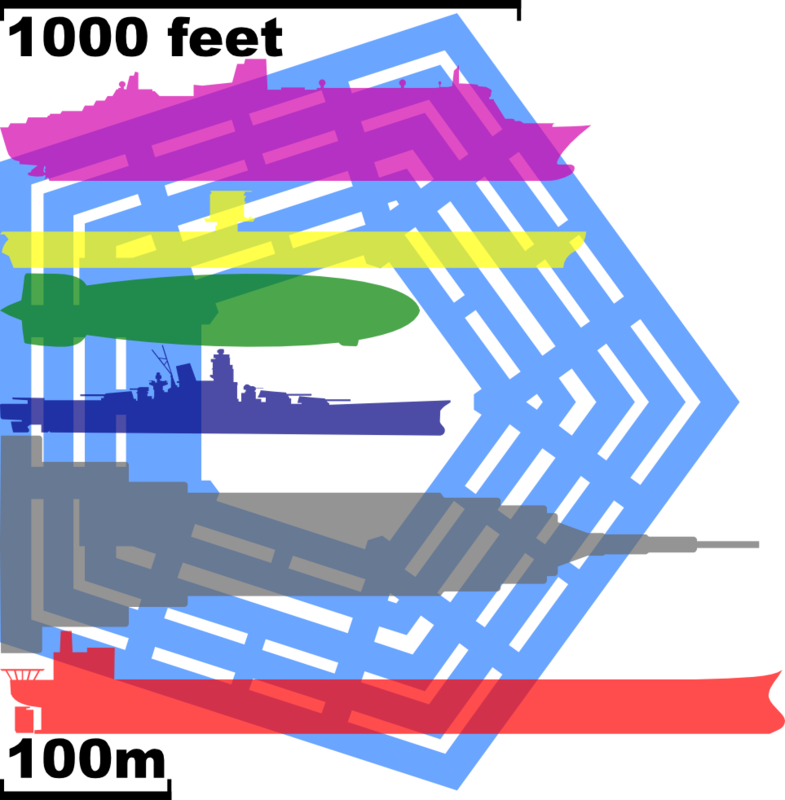 The largest ships so far. Seawise Giant was the longest ship ever constructed, longer than the height of many of the world’s tallest buildings, larger than the Petronas Twin Towers at 451.9 m (1,483 ft). In December 2013 Prelude FLNG became the longest ship ever constucted which measures 488 m (1,601 ft), built by Samsung Heavy Industries at Geoje Shipyard. Also four Batillus-class supertankers operated from 1976-2003 built at the Chantiers de l’Atlantique shipyards in France which had a larger gross tonnage.